Thank you Netflix for financing and distributing Alfonso Cuarón’s masterpiece, Roma. No offense to the small screens that Netflix often lives in, but this one demands to be seen on the big ones. 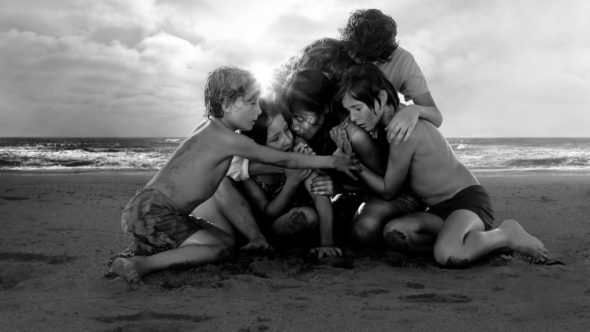 A breathtaking culmination of his work to date, Roma pulls in elements and themes, visuals and curiosities from every film Cuarón has made (including a wonderfully organic ode to the inspiration for one of his biggest), braiding them into a semi-autobiographical meditation on family life in the early 1970s. At the film’s heart is an extended group concerning an affluent Mexico City couple (Fernando Grediaga and the scene-stealing Marina de Tavira), their four children and their two live-in servants Adela (Nancy Garcia Garcia) and Cleo (Yalitza Aparicio). The family unit will morph, stretch and strengthen by film’s end as Cuarón envelopes us in a languidly paced but visually sumptuous exploration of Cleo’s point of view. A remarkable Aparicio quietly observes all that goes on around her—the tumult and the quiet of life inside and outside the house—as Cuarón’s camera performs a cross between poetry and ballet to capture those observations. Filmed in gorgeous black and white, the picture is showy without being showy, it’s realistic with flourishes of absurdism. More than anything, it is proof of Cuarón’s mastery as a cinematic storyteller. The same fluidity he brought to his Harry Potter and the Prisoner of Azkaban serves a different kind of magic here, capturing the intimate and the epic, the simple and the wildly complicated with pristine clarity. Sequence upon sequence offers a dizzying array of beauty, as foreground and background often move in glorious concert during meticulously staged extended takes that somehow feel at once experimental and restrained. The effect is of a nearly underwater variety, a profound serenity that renders any puncture, from a street parade moving blindly past the distraught woman in its path to a murder in broad daylight, that much more compelling. Roma is filmmaking of the most consummate skill. Though it’s anchored in family strife that might feel at home in a Lifetime melodrama, the film achieves an intimacy that’s grand, detailed and perhaps more than anything else, inviting. Accept that invitation, and Cuaron will serve you a feast not easy to leave behind, even if you want to.